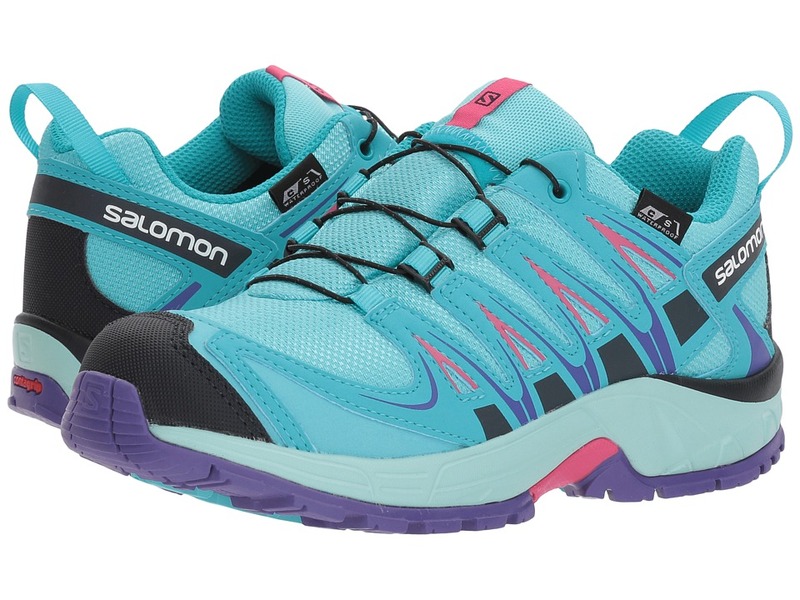 The new lightweight XA Pro 3D places your athlete closer to the ground while increasing comfort and stability by utilizing Salomon~s patented 3D technology. Light and fast, ready to race. Upper consists of sandwich mesh and synthetic parts. Gusseted tongue. Optimized molded Sensifit allows for a precise and secure fit. Gliding eyelet inserts. Quickfit lacing system. Protective heel cap and mud guard. Optimized protective toe cap. Textile lining material. Running Contagrip outsole. 3D Advanced Chassis. EVA molded/Triple density EVA midsole. Ortholite sockliner. Imported. Measurements: Weight: 9 oz Product measurements were taken using size 2 Little Kid, width M. Please note that measurements may vary by size. Weight of footwear is based on a single item, not a pair. 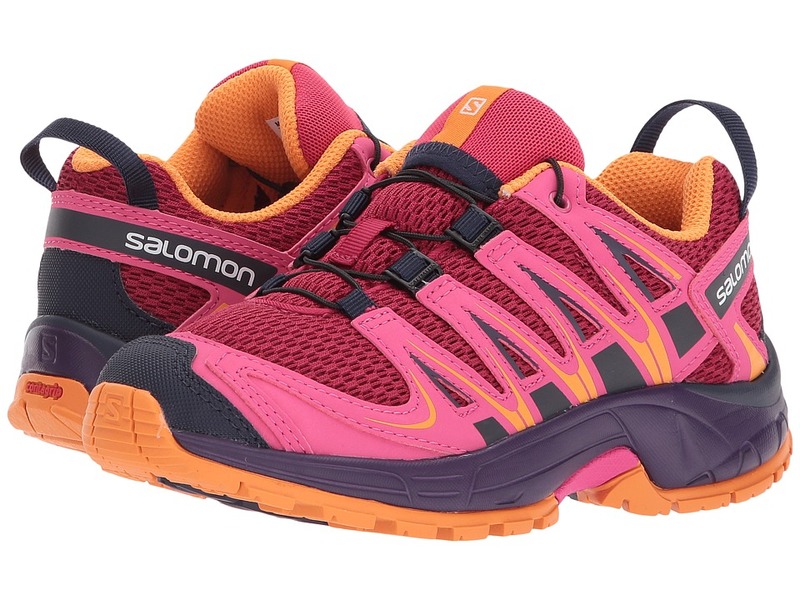 Take to the trails in the supportive and waterproof Xa Pro 3D Cswp from Salomon Kids! Upper consists of sandwich mesh and synthetic parts. ClimaShield waterproof breathable membranes keep the water out of their shoes without sacrificing breathability. Quickfit lacing system. Gliding eyelet inserts. Gusseted tongue. Protective heel cap and mud guard. Optimized protective toe cap. Polyester linings wick moisture away from feet contoured Ortholite foam footbeds enhance comfort underfoot. Dual-density EVA midsoles deliver enhanced durability and cushioning for all-day comfort. 3D Advanced Chassis. 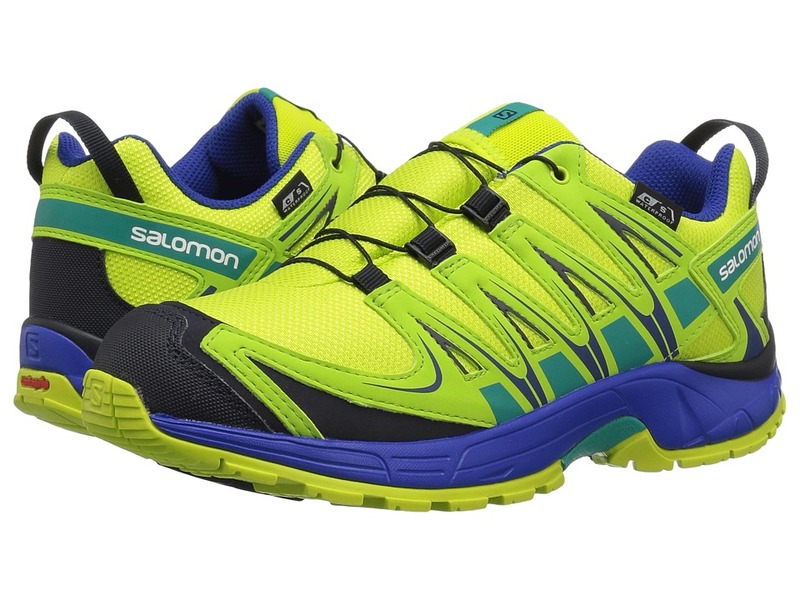 Nonmarking Contagrip rubber outsoles on the Salomon XA Pro 3D Ultra CS WP trail-running shoes deliver sure traction on mixed terrain. Imported. Measurements: Weight: 10 oz Product measurements were taken using size 2 Little Kid, width M. Please note that measurements may vary by size. Weight of footwear is based on a single item, not a pair. 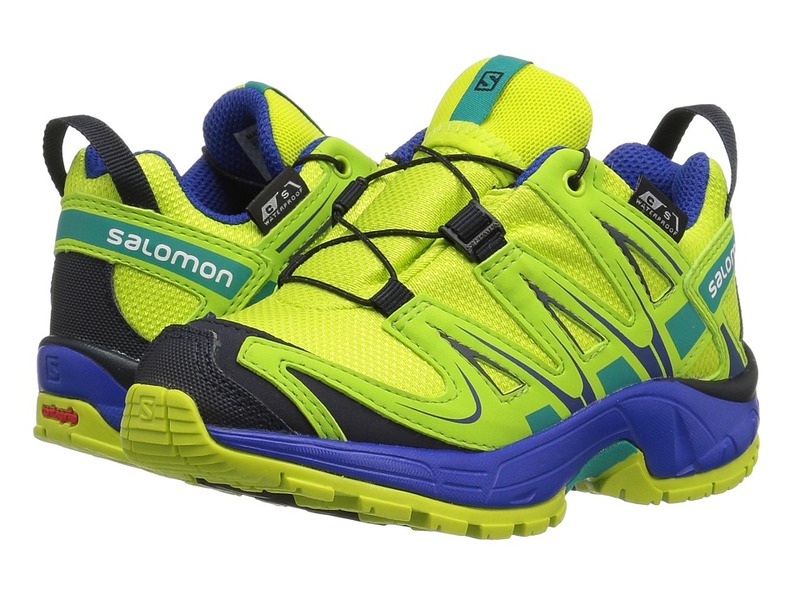 Take to the trails in the supportive and waterproof Xa Pro 3D Cswp from Salomon Kids! Upper consists of sandwich mesh and synthetic parts. ClimaShield waterproof breathable membranes keep the water out of their shoes without sacrificing breathability. Quickfit lacing system. Gliding eyelet inserts. Gusseted tongue. Protective heel cap and mud guard. Optimized protective toe cap. Polyester linings wick moisture away from feet contoured Ortholite foam footbeds enhance comfort underfoot. Dual-density EVA midsoles deliver enhanced durability and cushioning for all-day comfort. 3D Advanced Chassis. 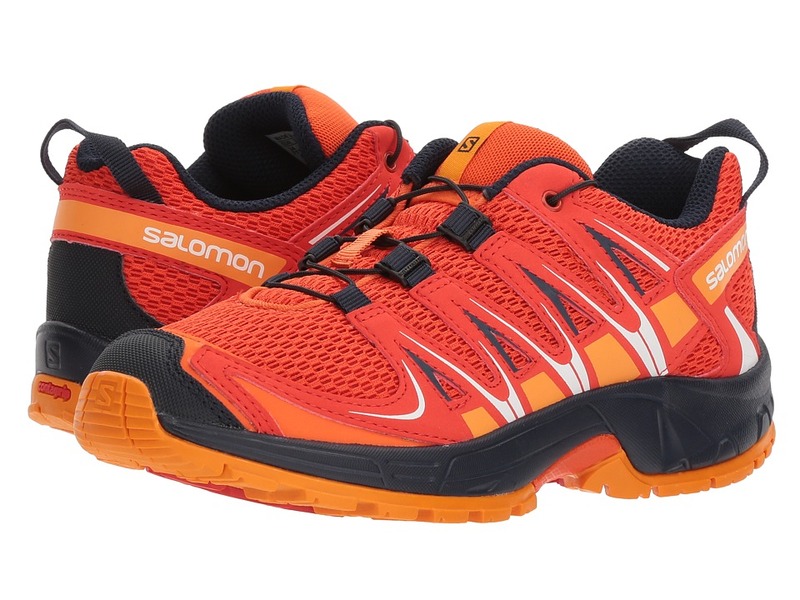 Nonmarking Contagrip rubber outsoles on the Salomon XA Pro 3D Ultra CS WP trail-running shoes deliver sure traction on mixed terrain. Imported. Measurements: Weight: 10 oz Product measurements were taken using size 9 Toddler, width M. Please note that measurements may vary by size. Weight of footwear is based on a single item, not a pair. The new lightweight XA Pro 3D places your rookie closer to the ground while increasing comfort and stability by utilizing Salomon~s patented 3D technology. Light and fast, ready to race. Upper consists of sandwich mesh and synthetic parts. Gusseted tongue. Optimized molded Sensifit allows for a precise and secure fit. Gliding eyelet inserts. Quickfit lacing system. Protective heel cap and mud guard. Optimized protective toe cap. Textile lining material. Running Contagrip outsole. 3D Advanced Chassis. EVA molded/Triple density EVA midsole. Ortholite sockliner. Imported. Measurements: Weight: 9 oz Product measurements were taken using size 2 Little Kid, width M. Please note that measurements may vary by size. Weight of footwear is based on a single item, not a pair. 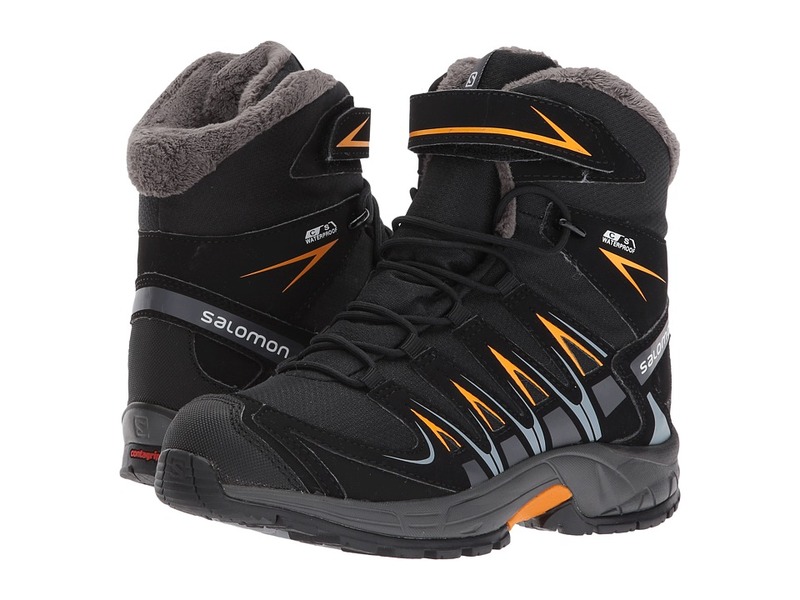 The new lightweight XA Pro 3D places your rookie closer to the ground while increasing comfort and stability by utilizing Salomon~s patented 3D technology. Light and fast, ready to race. Upper consists of sandwich mesh and synthetic parts. Gusseted tongue. Optimized molded Sensifit allows for a precise and secure fit. Gliding eyelet inserts. Quickfit lacing system. Protective heel cap and mud guard. Optimized protective toe cap. Textile lining material. Running Contagrip outsole. 3D Advanced Chassis. EVA molded/Triple density EVA midsole. Ortholite sockliner. Imported. Measurements: Weight: 9 oz Product measurements were taken using size 9 Toddler, width M. Please note that measurements may vary by size. Weight of footwear is based on a single item, not a pair. The new lightweight XA Pro 3D places your rookie closer to the ground while increasing comfort and stability by utilizing Salomon~s patented 3D technology. Light and fast, ready to race. Breathable mesh upper with synthetic overlays. QuickFit lacing system over gusseted tongue. Pull-on tab at heel for easier on and off wear. 3D Advanced Chassis offers optimal stability and protection in a lightweight package for unpredictable terrain. Sensifit technology cradles the foot to offer a precise and secure fit. Contagrip HT outsole is durable and grippy for wear on various surfaces. Imported. Measurements: Weight: 6 oz Product measurements were taken using size 9 Toddler, width M. Please note that measurements may vary by size. Weight of footwear is based on a single item, not a pair. 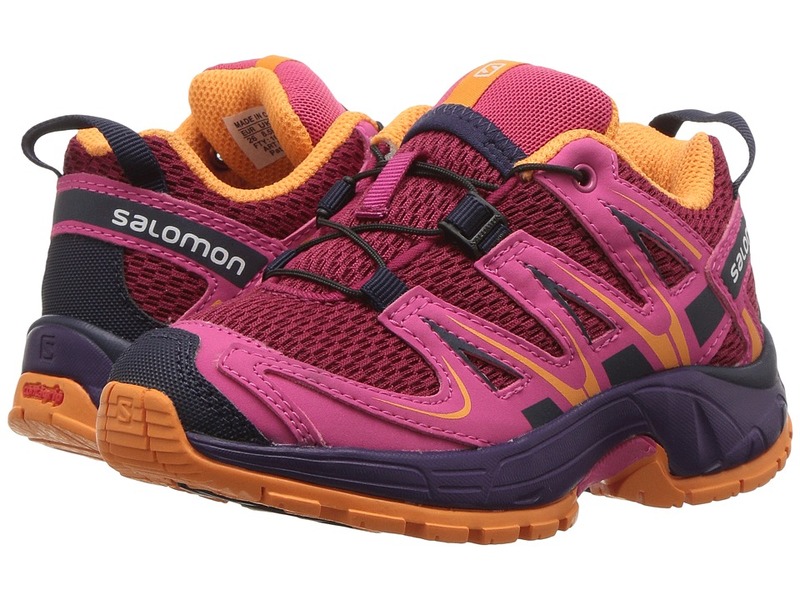 Take your little one to the trails in the supportive and waterproof Xa Pro 3D Cswp from Salomon Kids! Upper consists of sandwich mesh and synthetic parts. ClimaShield waterproof breathable membranes keep the water out of their shoes without sacrificing breathability. Quickfit lacing system. Gliding eyelet inserts. Gusseted tongue. Protective heel cap and mud guard. Optimized protective toe cap. Polyester linings wick moisture away from feet contoured Ortholite foam footbeds enhance comfort underfoot. Dual-density EVA midsoles deliver enhanced durability and cushioning for all-day comfort. 3D Advanced Chassis. 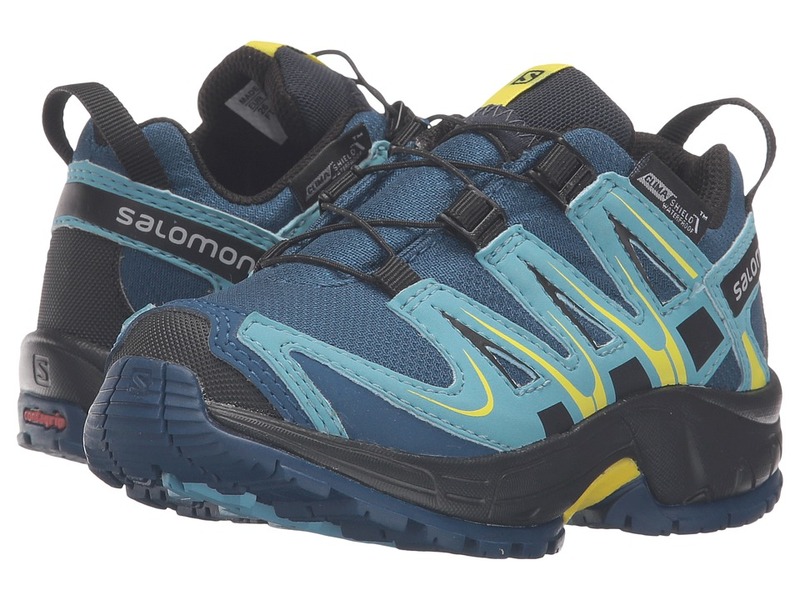 Nonmarking Contagrip rubber outsoles on the Salomon XA Pro 3D Ultra CS WP trail-running shoes deliver sure traction on mixed terrain. Imported. Measurements: Weight: 7 oz Product measurements were taken using size 9 Toddler, width M. Please note that measurements may vary by size. Weight of footwear is based on a single item, not a pair. 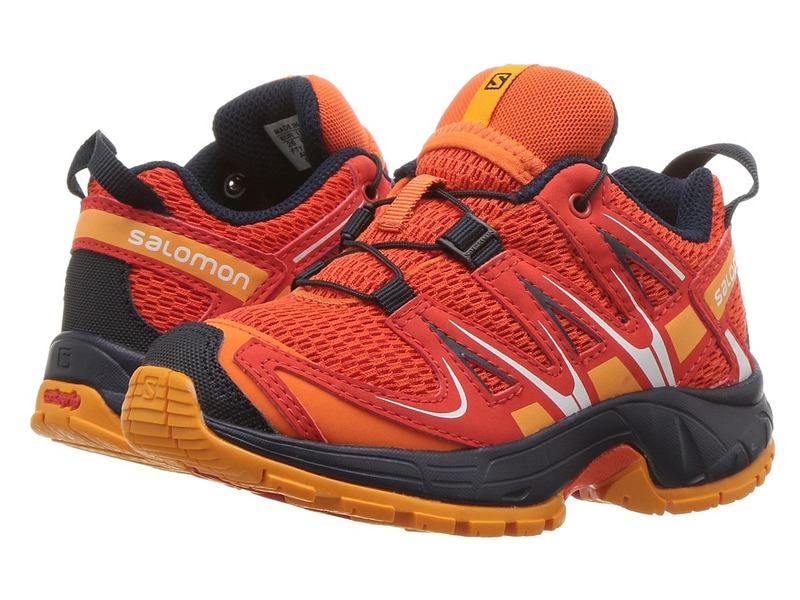 Rest your mind and feet on the ease and protection of the Salomon Kids XA Pro 3D Winter TS CSWP. Through rain, hail, snow or storm, these boots will keep on kickin~! Water resistant Climashield textile upper. Hi-top silhouette. Full bootie construction keeps your boot waterproof from top to bottom. Synthetic fur cuff for a soft touch against leg. Bungee lacing with single hook-and-loop strap. Gusseted tongue bridges to the upper to stop debris from getting in shoe. SensiFit holds foot in a snug fit. Thinsulate is lightweight and moisture-resistant for a great wear and healthy foot environment. Protective heel cap adds stability and protection. Die-cut injected EVA cushioning in midsole. Non-marking Contagrip synthetic outsole delivers traction on multiple surfaces. Mud guard offers protection along base of shoe for wear on various elements. Imported. Measurements: Weight: 13 oz Product measurements were taken using size 2 Little Kid, width M. Please note that measurements may vary by size. Weight of footwear is based on a single item, not a pair.